La voz del estudiante importa, y el momento es ahora! We are right in the middle of our 7-month campaign to ensure that students’ voices are heard, valued, and reflected in the district’s accountability and funding plans. CFJ and the Student Voice Coalition have asked the State Board of Education to define the student’s consultation by creating a formal process, giving the districts a menu of options, and updating the guiding questions. During the month of May, youth from across the state held meetings with members of the local and state Board delegations to tell their stories and express how important the student’s voice is to their success. 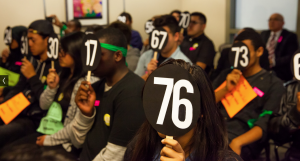 May 8, 2014 More than 50 students and allies across California came together to demonstrate that the student’s voice through the materials of moving public testimonials and a “faceless students” demonstration within the State Board of Education, assembled from . The students wore numbered masks to show that they are not just a number or a statistic, they are students with meaningful voices! Jalisa and his companions should not have to fight to be heard! Stay tuned for updates on all of our next action. We are mobilizing youth and parents from across the state to the State Board of Education July 10 meeting in Sacramento. This will be a critical moment in the Student Voice Campaign to show the members of the State Council that students need a formal process to participate in local budget decisions. The student’s voice matters, and the moment is now! ← Student Voice Matters, and the Time is Now!